Allison Winters is rather well-adjusted by comparison. I’ve touched on the concept of atmosphere making up for flaws time and again, usually throwing in the requisite love letter to Metroid Prime 2. I’m in love with games that cultivate a dark and nasty atmosphere, and what that says about me is a whole other topic. It’s coming up here yet again due to Lydia’s use of an unsettling atmosphere and story to discuss parental neglect and abuse. However for all the story brings, and it’s not much, the gameplay can barely hold a candle to it. The first issue that comes up is the glacial pace by which Lydia gets anywhere. I don’t mean this from a story perspective, though the dialogue can drag in certain parts, more in the actual movement of Lydia herself. She toddles across the landscape with no sense of urgency, making getting from point A to point B a slog. Luckily most puzzles require less speed and more a degree in trial and error. Older point and click adventure games had a problem with what’s known as moon logic or in layman’s terms: how does that solution make any sense? Lydia’s puzzles all have those kinds of solutions, leaving me just guessing and hoping for the best. An early puzzle requires clicking a circle of fireflies in an order that if traced forms a star. I figured it out easily enough, though to be fair my mind also runs on bizarre logic, but for a normal person I feel like that’s asking too much. On the other hand the game’s mercifully short length means fewer puzzles to have to guess at. The story rides the line between clever and begging to be interpreted. 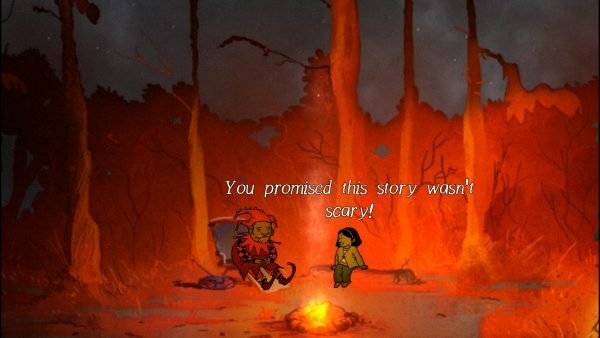 The story follows the titular child as she searches for a monster (her abuser) with her teddy bear; brilliantly named Teddy. Each chapter is a painfully obvious metaphor for a traumatic event in her life. For example, the second chapter, The Fool, is about a trip in the woods with her father, who she sees as a spooky jester for his silly stories and carelessness with his words. On this trip Lydia learns that she was the result of an unwanted union her father desperately wants to get out of. The symbolism is too blunt for it’s own good and makes the story seem like it’s trying too hard to be dark and arty. The story itself is not bad, hitting all the right notes emotionally without being overwrought. It can be at times for just how brutally it presents its scenes of emotional abuse. The abuse Lydia faces throughout these various scenes feel all too real from overhearing she was an unwanted child to her mother gaslighting her after a car wreck that she couldn’t have prevented. Building up to a satisfying climax where she finally stands up to her cruel mother, here represented by a face changing monstrosity. The art and atmosphere are truly the stars of the show. The art reminds me of the older PC game Nightmare Ned, with its mostly black and white color scheme unconventional characters and nightmarish monster design. Teddy’s design deserves a shout out for being one of the few colored things and having a very uncanny valley look to him. He’s supposed to be Lydia’s guide of sorts but he’s very flighty and the fact that he’s the best we get makes the game a little scary. The lack of music, preferring more ambient sound, does draw you into the landscapes that are just slightly off kilter. Lydia reminds me of Infectroem in that there is great potential here but it falls short of anything truly great. The atmosphere is dank and unsettling and could be put to better use in another game with more substance. 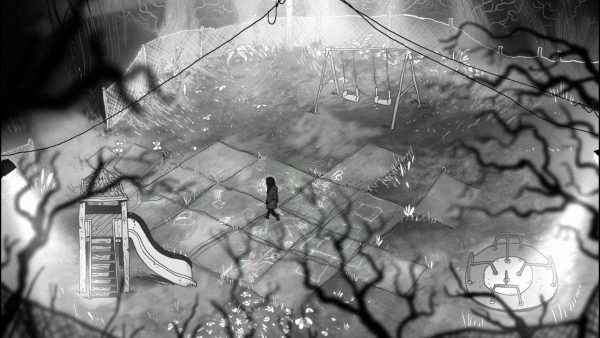 How it stands, Lydia’s story can’t redeem its mediocre gameplay and bizarre puzzles. Now if you’ll excuse me, I’m off to make out with Metroid Prime 2 some more. Allison Winters is a writer from Ohio who dreams of making a pun so wonderful the whole world tells her to shut her mouth. If you like what you read then you can check her out at her blog or Twitter.